I forgot to mention the coolest thing about the last Ubucon in my summary. I heard that my friend Sean Moss-Pultz (the person who started the OpenMoko project) would be in New York the week of Ubucon so I managed to contact him and get him to drop by on his way to the airport so we could have lunch. To my surprise, he had one of the early versions of the free-phone for me (I wasn’t expecting one for several weeks). 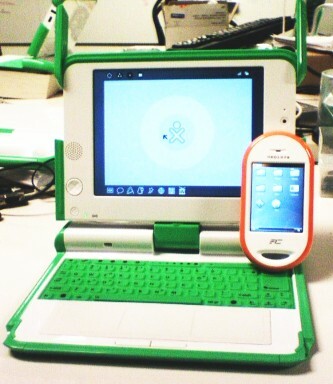 I had brought my OLPC XO so, for the first time ever (as far as we know) we managed to get the two coolest, and most important, technology platform projects in the world together. While the XO and OpenMoko share a commitment to freedom, the similarities between the projects are, in fact, also skin deep. If we all work hard, we can look forward to a future that is free. Apparently, it’s also white with bright trim. Apologies for the pictures taken from my current inferior, both ethically and technically, mobile phone. Actually, Chris Ball from OLPC was using my OpenMoko. The two first met two weeks ago at Ubucon. I was just slow to put the pictures up on my website. Sorry about that! Yikes, does my hand really look like that, or did you tweak the colors? I think I may be dying! In fact, I tweaked the colors. But it looks pretty good on my screen. just a bit of fun.. The joke in Spanish about LoCo teams was intentional. That’s why it wasn’t “LocCom” teams. I’m pretty sure the moko thing was just an unfortunate cooincidence. Thanks Dan. I’m glad you appreciate it. Next PostNext What’s Wrong With My iPod?